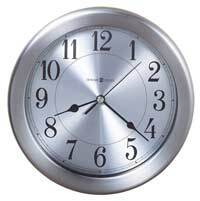 The Howard Miller Libra 625-530 Wall Clock is an 8-1/2" diameter wall clock with brushed nickel-finished case offers a black dial with silver Arabic numerals, a minute track and a glass crystal. The spade hour, minute, and second hands are silver. The locking rear cover twists off for easy mounting. 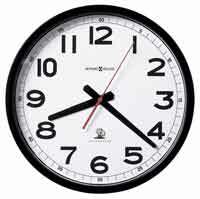 Quartz, battery-operated movement. Size: Dia. 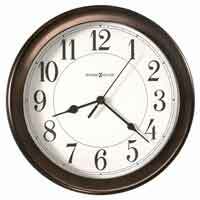 8-1/2", D. 1-1/2"
Clocks for sale at The Clock Depot including the 625-530 at discount prices.